At Catholic Journeys, we believe Good Business Matters. What our Clients and Press have to say about Us! At Catholic Journeys we take great pride in our ministry and in the work we do for our pilgrims. Over the years we have garnered the reputation for providing outstanding service and the best possible pilgrimages at very affordable prices. Below are just some of the comments we’re received from our pilgrims! Thank you Jimmy for keeping us going at all hours of the night. Appreciate your dedication. I am blessed to have been in the company of each one of you and getting to know you. to bless you and all of your family. It was a blessing and a pleasure to meet every one of you! 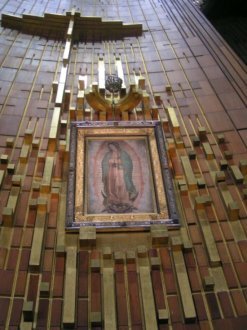  I am overwhelmed with gratitude and love for Our Lady and the Lord! Thank you for all of your words of wisdom and love! I will treasure this amazing experience in my heart forever! We wanted to let you know that we arrived home this past Wednesday night and are still in the clouds. This trip is absolutely memorable to all of us. We had an amazing, fantastic, wonderful, marvelous, lovely, beautiful trip that we would love to do again. We made many new friends and all of our tour guides, drivers, and group members were awesome. Thank you again for all your help. Our thanks to you and Jimmy for making our trip to Poland so memorable. We thought that the hotels that we stayed at were excellent. Again thanks for all your help and give Jimmy our best. organized - and the tour guide was awesome. I can't put into words how wonderful everything was. My trip was life-changing. It was a perfect pilgrimage. While there was no shortage of moving inspirational and faith-filled experiences, there was also fun and laughter and silliness. The added day trips to Dubrovnik and Zagreb were also nice because it added a bit of “vacation” to the pilgrimage as well. I felt blessed to be able to meet and stay with Marjana. She is the most humble person I’ve ever met and an inspiration. We were also lucky enough to witness one of Ivan’s apparitions and say the rosary with him as well. The MIR group did an amazing job of providing many many opportunities for us to grow in faith, from private masses to speakers to tours. My 19 year old daughter traveled on the trip with me, and I was particularly moved by how much effort was put into making it a “youth friendly” pilgrimage. I wish I could have had the rest of my family with me. I hope to go again. 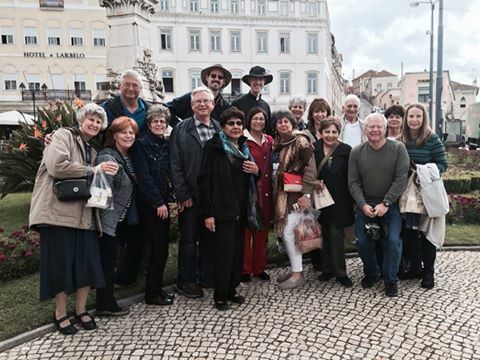 Catholic Journeys Holy Land Pilgrimage Group from 2016, enjoyed a special reunion with Fr. Ronnie Calkins at the home of Ed and Marian Blanchard. This group has really bonded together after their pilgrimage and have been having reunions since their return. How Wonderful! Sharing Faith and Friendship Together! Thank you for all your help. My trip was marvelous as were the people, hotel, guide, bus driver and Father Bob. I so appreciate all you did. Sheri and I are so thankful for all you have done while on this trip. It was a trip of a life time for us, and was so educational. You and your staff worked hard to make this a magical as well as special journey with special people. Your father and Joy were fun to be with. I was able to capture some photos of your father having a good time, of which I will have printed for you. Sheri and I will certainly recommend you as a travel planner of choice. Once again, thank you for all, it was a wonderful experience with wonderful people. Thank you very much for all of your hard work on our very exciting Far East adventure! I can't thank you enough for all you did to make our trip an excellent experience. Welcome Home, Pilgrims. 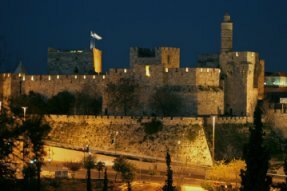 I have already seen some pictures and heard some stories of your Holy Land experience. It sounds as though the Good Lord poured out many blessings. I hope you will be able to reflect about your experiences in the coming days before the workload of the semester takes hold. I want to thank Fr. Kelly for serving as Chaplain for the Pilgrimage and Deacon Aaron for handling many logistical details of your experience. By copy of this email, I also thank Jimmy Hyland and AnnMarie of Catholic Journeys. There were many special moments and people on this trip. Having the opportunity to visit and experience so many sacred places leaves me in awe. 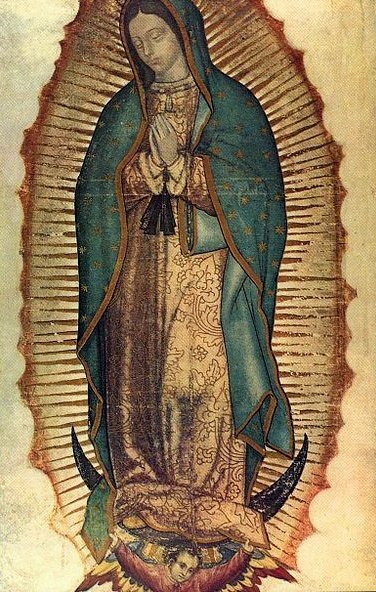 Our lady's presence and the Lord's presence were felt so deeply, at times, that it is difficult to adequately express. The experiences of the trip helped me to put a lot of things in perspective. When you actually think about the sacrifices of Jesus and his mother, Mary, some of the things we consider difficult, burdensome or hardships really are trivial in comparison. It is difficult to actually describe the feelings and experiences in detail but it was AWESOME!!!!!!! Fr. Mark Beard and Terry Bellon were absolutely wonderful and very organized. We thoroughly enjoyed traveling with and sharing this experience with such a great group of people, too. Thank you for your assistance with our many questions and changes while scheduling this trip. Your expertise and patience made all of this possible for us, to begin with. I am very thankful that my friend, Pat, was so persistent about me going on this pilgrimage. Thank you for the gift certificates. It would be nice to go on another pilgrimage; we're just not sure of exactly when we will be able to go again. I hope you had wonderful holidays. 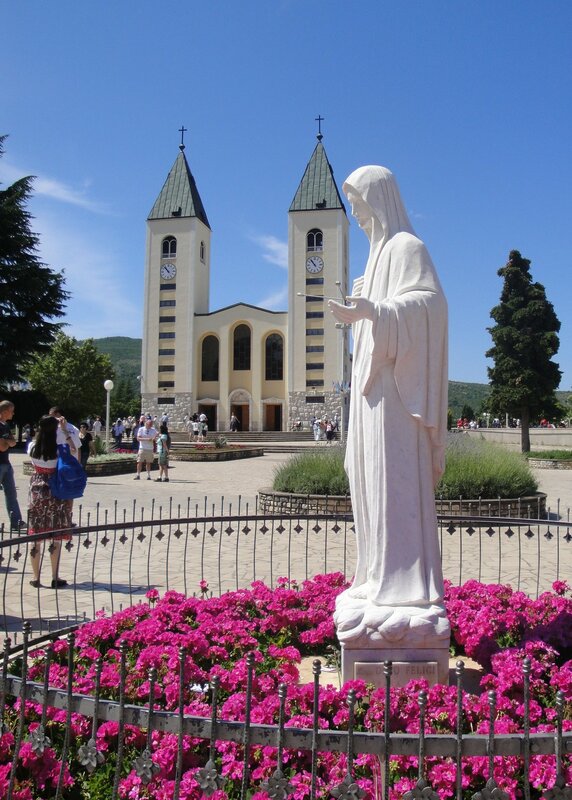 The Medjugorje pilgrimage was wonderful…we hated to leave!! First, it was an unforgettable spiritual experience – there are no words to accurately describe that. Second, everything was so well arranged for us; from the accommodations, transfers, daily schedules and wonderful optional tours, we felt there was a very good balance of time between activity and reflection. Food was wonderful and we are especially thankful that our dietary requests were fully accommodated. We do not eat meat, which often poses a problem if there is a fixed meal/no menu to choose from. But our host Ivicka asked about food preferences the day we arrived and his family provided fish for our evening entrees. So thank you especially for that. Cannot say enough about the superb job done by our guide Andrew Moulds, our host Ivicka and also all the local guides and drivers. Their organization, hard work and caring made everything fall into place seamlessly. We appreciate you too, AnnMarie!! You were always courteous and responsive to us during the planning stages. We understand how difficult it must be to plan a trip like this and field so many questions and requests!! Oh my AnnMarie. I can't even begin to tell you how amazing this spiritual journey was for me. I couldn't get over the outpouring of so many Christian gathered together believing in God. My personal experience was awesome and it gave me hope that the world (although deteriorating as time goes by) isn't hopeless. Ivica and his family were amazing. Their food was delicious the planning of things to do and just their kindness was unforgettable! I knew some of the folks from my parish including Father Frankie who we all love. But I also met some new people that I'm so happy to have met. Now my favorite person is Andrew who came in place of his grandmother who works for you guys. She sounds like an amazing lady and I can see why she has such an awesome grandkid. I am extremely happy with the way everything went down from the planning to receiving our backpack full of everything we would need to our flights all being on time and more importantly our luggage arriving with us. Thanks again for everything and I hope to travel with you guys again in the future. September 2016 "Faith & Food" Pilgrimage to the Holy Land with Clarion Herald, Fr. Ronnie Calkins, Chef John Besh and Peter Finney Jr. It was great to meet & travel with you on our trip to the Holy Land. Sherm & I want to thank you for organizing such an incredible Pilgrimage.. The itinerary following in the footsteps of Christ & His Mother Mary really helped in my understanding of His/Her life on earth. I continue to feel my faith deepening... a rebirth.. When Sherm finishes organizing his photos & finds anything exceptional, he'll post. We would be happy to share our great experience with Catholic Journeys w friends/family who are interested in traveling to the Holy Land or other religious sites. Now, we're heading to the gym to work off the incredible meals we had ! Thanks to Catholic Journeys for planning a fantastic pilgrimage to Israel! I am so fortunate to have been able to experience it with you all. I truly couldn’t have asked for a better group of folks to travel around Israel on a bus for 11 days with! Here is my email address. As I mentioned, I’d love to be included on the email chain when you email out everyone’s contact info. Hope you had a great time as well! We wanted to thank you again for all of your assistance with our pilgrimage to the Holy Lands, it was a life changing experience. We enjoyed all the pilgrims who made the journey with us and would like to keep in touch with them. So we would appreciate it if you could forward us a copy of the list of pilgrims we traveled with. You did a terrific job of putting together a wonderful spiritual pilgrimage. I look forward to getting back to you at our next gathering. Be assured, I will highly recommend your company and services to all who are interested in a Holy Land tour. Sherm & I wanted to say "thank you" for the wonderful job you did in organizing & planning such a faith deepening Pilgrimage to the Holy Land. We had a great time! Fr. Jim and Alessandro (tour guide) were outstanding. As a result, we may take another religious pilgrimage in the future. I just wanted to let you know that we had the best time on our trip. Everything was excellent and beyond acceptable. First, I would like to thank our spiritual leader, Fr. Matthew, and our hosts Gay and George Hernandez for their exceptional leadership and knowledge of the Holy Land. This was my first trip to the Holy Land and religious pilgrimage. It was much more than what I expected it would be. I will never forget the first time I walked into Holy Sepulchre Church. The emotion was overwhelming: seeing and touching the place of Jesus' crucifixion and burial; hearing the masses, the singing and chanting; the scent of incense and oils; and the people from all over the world coming together. Without a doubt our leaders, including our guide and driver, were exceptional, however, everyone in our group made our trip special. When I returned the question typically asked, "was it safe?" Yes, I felt perfectly safe the whole time. Thank you and your staff for a a great trip and hope to book another in the future. We had absolutely wonderful experience! Felipe was great and he brought along his nephew to help since he was hobbling on his ankle. So informative and helpful. The hotel was superb with service that my kids really enjoyed. I have already started to save for our next trip. 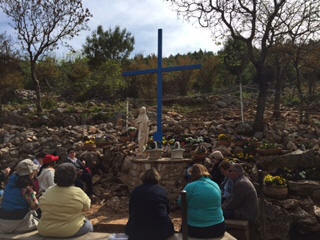 Trip has been wonderful, Medjugorje was awesome and kids all shared at party after we renewed vows, they loved it. Dragon outdid himself for us. Rome also great, hotel very nice and near Borgo Pio. Rooftop view fabulous. Thanks for everything You did for us to make this possible!!! Sending you herewith some Photos of our Journey to Medjugorge ... We had a great experience and Definitely having Dragan as our Guide was a key factor for a smooth and painless trip. We will recommend your company to our friends and family . Many thanks again for your cooperation and services. Good Bless and have a great summer. We had an awesome trip to Fatima, The Shrines of Spain and Lourdes. It was flawless. Everything went perfect. We want to thank you both Ann Marie and Jimmy for all of your attention and good service. We hope to take another trip with you in the future. Everything went perfectly throughout the trip.. We all arrived on time last night filled with God's graces.. Thank you for a wonderful pilgrimage. Once again, the guys loved the Holy Land Pilgrimage. 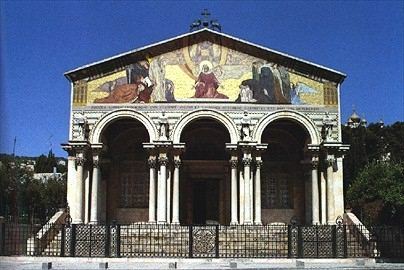 They especially raved about the tour guide (Said), the Notre Dame Conference Center in Jerusalem, and being in Bethlehem on Epiphany for the celebration of Christmas. 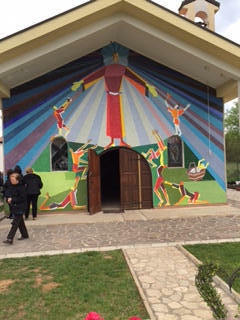 Thanks to you and Ann Marie for your work in facilitating such a blessed trip for the deacons. It’s time to think about next year’s January Pilgrimage. We are just driving home and what a BEAUTIFUL EXPERIENCE! Definitely the trip of a lifetime! Thank you for all the help in making this dream trip come true. I am already thinking of my next trip! Thanks again for this beautiful experience and I thank God for using Catholic Journeys! You don't know this, but Maria spoke highly of you and how you gave her figures and a contract when other travel companies did not reply. She was impressed with your fast and courteous business practice. That was great to hear! The trip was amazing. The guides in Rome were amazing. Francesco made sure we had the best position to view Pope Francis! 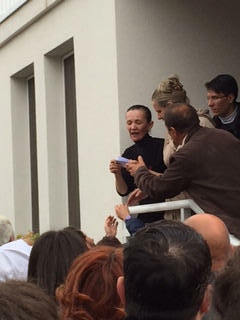 In Medjugorje, the host was very hospitable. He was very accommodating in what we wanted to see. Over all it was a memorable trip ! Margaret and I enjoyed the pilgrimage. We were particularly thrilled to be part of the papal audience in St. Peter's Square and really see the pope. We also liked the Vatican museum and St. Peter's Basilica. I was awed by the Eucharistic Miracle of the monk who had doubts about the presence of Jesus Christ in the Eucharist. Seeing the five globules of coagulated blood and the flesh was life changing for me. Padre Pio's old and new churches in San Giovanni Rotondo were impressive and so were St. Francis and St.Care's Basilicas. The hotels were great and the food was super. You were awesome Thank you and God Bless. We are so blessed after this trip! We had a great and wonderful time. The guides were excellent and they took care of us very well. We did not have any problems at all. Thank you for everything you did to make this possible! What a deeply spiritual pilgrimage.....graces abound! Thank you for your diligent work. I am so blessed to have been a part of this journey. Your professional expertise the best! Father Stan an outstanding spiritual advisor, great hotel / location and food! The guides were just outstanding. We had such a congenial group. Please convey my sincerest thanks to our priest. They all touched the pilgrims in a special way! "The trip was wonderful. It may have been the best one I've ever taken. Everything went very smoothly. Thank you for making all the arrangements." "We are in the lounge after the greatest hotel/airport experience we ever had! All total, there were at least 9 persons looking after us. ... Thank you for making all the arrangements." 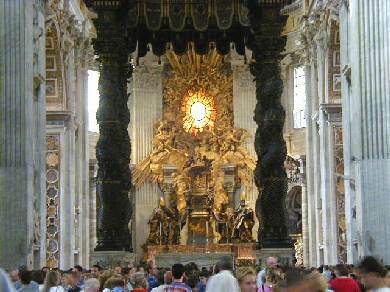 "Just a note to tell you how wonderful the trip to Fatima and Lourdes was. Everything went as scheduled. The trip was great, the weather wonderful, but the guide was really the best, Thank you for her. Fatima is truly a beautiful experience, as was Lourdes. Our guide in Toulouse was very punctual and made our ride to Lourdes very pleasant. Our guide in Lourdes was extremely knowledgeable and very enjoyable. You could not have picked a better group of people to attend to us. Thank you again for such a wonderful trip. I hope I can travel with you in the future." "This trip was a wonderful experience, it surpassed all of my expectations." "Everything was great: the tours, the hotels, our guide. It was a trip that I will never forget and all that you did to plan it is greatly appreciated." "It was a well planned and executed pilgrimage. Thank you!." "Thanks for all you do. I can't tell you how many people told me they were so impressed with how everything was seamless." "The tour was well planned and went very smoothly." "Catholic Journeys did a fantastic job getting us all home in a timely fashion." 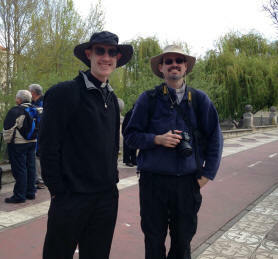 "I appreciate all the work Catholic Journeys did on our behalf after the scheduled tour."